A new generation of stories and tales. Love this place when i was a child hot and sweaty from the tobacco fields with my Granddaddy we would walk in and Ms. Dorothy or Ruby would write up the charge and my Brother and I would leave with our favorite snack mine a frozen Milkyway and Coke my Brother liked peanut butter crackers and Coke. Priceless Memories. 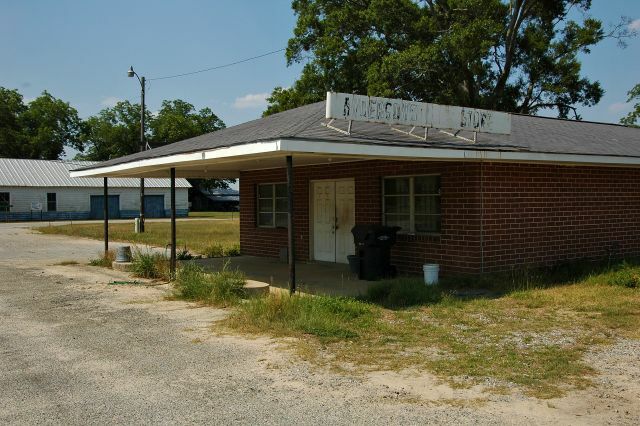 This store was owned by Ms. Dorothy Anderson who lived behind the store, and was run by Ruby Jean Purcell who lived across the side street and behind the Water’s store. The original location for the Anderson store was across the street that the brick building faces. The store moved to the brick building some time in the ’50s and stayed open until late January / early February of 2001 when Ruby Jean passed away. This brick building sold gas until the mid ’90s (I think) and would routinely offer store credit via “a tab” for families that lived in the area and frequented the store. It wasn’t unusual to visit the store and see Ruby Jean and Ms. Dorothy sitting in rocking chairs by the window (which is where the window-unit AC and the gas heater were). They’d be sitting and talking with a regular customer or two, maybe a family member, and often times cutting and styling hair which was a common service offered at Anderson’s. Ruby Jean was the go to person when there was any kind of emergency. I remember as a very young girl, the wood stove which was replaced by the gas stove. Many customers would sit around the stove and tell tales and exchange many blessings. it was a sad day when Ruby Jean died and the store closed. An icon that will truly be missed.